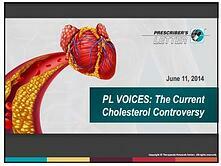 Download this webinar to listen to the live cholesterol controversy debate from experts and guideline authors. The key recommendations from the ACC/AHA cholesterol guidelines. How the proposed NLA recommendations differ from ACC/AHA guidelines. What patients may benefit from statin therapy. Which cardiovascular risk calculator should be used. When should non-statins be prescribed, and more. Download the complimentary webinar and slide deck today! Get the Webinar and Slides!